The 20 picture story books are a fun way for kids to learn to read! Dr. Rebecca has worked as a clinical psychologist, and lectured in psychology at universities. Rebecca’s particular area of clinical and research interest is improving emotional wellbeing, and she has worked extensively with primary school aged children, adolescents, and university students with this aim. Rebecca has authored several publications in both Australian and international journals on topics including the factors that enhance good mental health. Leighton spent 25 years working as a primary school teacher. He has worked extensively with children in a classroom setting and also developed and implemented curriculum course material for Distance Education learning. He has also written and produced an extensive range of audio visual educational materials including a comprehensive library of children’s music and songs. In his spare time, he continues to work as a professional pianist/musician in a variety of different roles and settings. Leighton, a school teacher, always wanted to create a series of picture story books that would have purpose and meaning and engage children whilst helping them to learn to read... And Rebecca, a clinical psychologist, always wanted to help bring awareness to children of important social and emotional life skills such as being organised, sharing, making friends and caring for the world. So they joined forces to create a series of picture story books that would fulfil both aims. They decided to base the books around music and bugs because music is an excellent tool in which to teach children reading... and bugs… well all kids love bugs. So after many years of research, writing and creating, the Muzicbug Readers, a set of 20 picture story books, was born. The Muzicbugs are mighty fine musicians and they need to be heard! So Rebecca and Leighton created a narrated audio track to complement each book. Each book, with its’ own unique story has a narrated soundtrack with original music, character voices and sound effects. Over many months in the studio, fifty professional musicians were recorded for the sound track, showcasing the variety of musical sounds. With the books and audio track in place, it was time to create the Awards Book which has the Muzicbug Awards Chart, stickers and hints sheets. After reading each story, children can get an understanding of each life skill by doing practical things to earn stickers. The handy hints sheets list examples of things that children can do, to earn these stickers. This Awards Book helps reinforce positive behaviours in children and enables them to extract purpose and meaning from the stories, essential for learning to read. 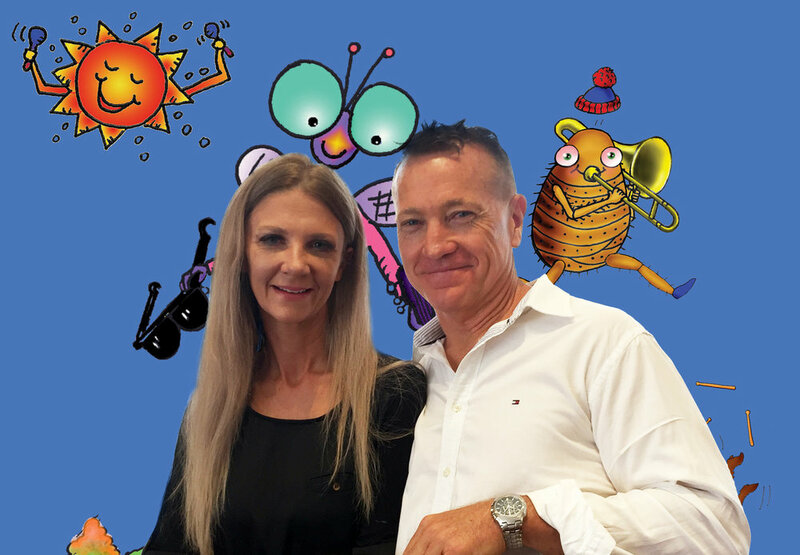 The creators take great pleasure in introducing the Muzicbug Readers to your children.